back() is called to get a reference to the last string in the container -- presumbaly one created using the above push_back method. read_lines() calls this function to indicate to the line accumulator that the most recently read line, if any had a CR character removed from it. This function will only be called if there is a trailing CR and if the removeCR flag is passed to read_lines(). 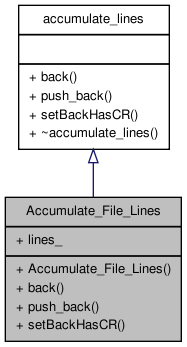 This struct implements the bridge between the FileName::read_lines method and the lines_ data member of the Impl class. The lines_ data is a collection of pointers to std::string, not std::strings directly so this class performs the needed copies and dereferences to make the interface look right to FileName::read_lines. Definition at line 1893 of file texteditor.cxx. Definition at line 1906 of file texteditor.cxx. Definition at line 1916 of file texteditor.cxx. Definition at line 1911 of file texteditor.cxx. Definition at line 1921 of file texteditor.cxx. Definition at line 1904 of file texteditor.cxx.